Bull snakes (Pituophis melanoleucus) are frequently mistaken for rattlesnakes due to their ability to vibrate their tail and hiss when alarmed. 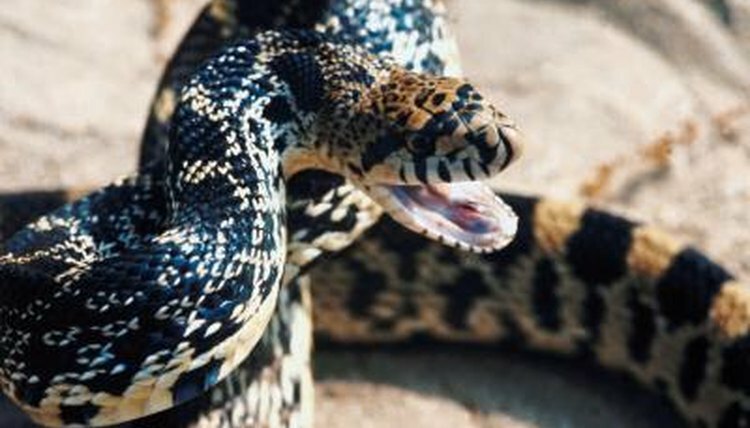 These large, nonpoisonous snakes are constrictors; they devour numerous rodents over their lifetimes. You cannot tell the exact age of a bull snake unless you recorded its date of birth. But you can hazard a guess based on size. Juvenile bull snakes hatch from eggs 2 to 4.5 inches long, emerging at 12 to 18 inches in length. The baby snakes are fully equipped to devour rodents. If captured and handled at this age, a bull snake will usually become tame over time. Bull snakes reach sexual maturity at about 2 years of age; females may be older before engaging in breeding. By then, they have attained a length of at least 4 feet -- a shorter bull snake, then, will be less than 2 years old. Mature bull snakes average 5 feet in length and can exceed 6 feet. As snakes mature, their bodies become thicker and their heads becomes broader than younger snakes'. Vida Preciosa International, Inc.: How Can I Tell the Age of a Snake?